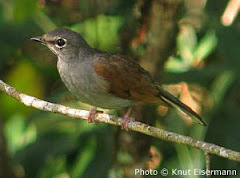 Yesterday, 11 July 2008, a small group from The Patzcuaro Birding Club met at Corazon de Durazno at Georgia and Chuck's interim abode (they are building a house in Arocutin). We thank them both. 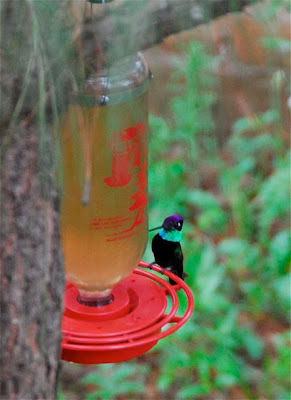 Hummingbirds flocked to their feeders; we saw as many as 25 at a time. I personally identified 5 species and got what I call an "eyeful" which helps imprint the image on my brain. I observed them with the naked eye from a distance of 3 feet , watched them at length with binoculars, and studied them through the scope. It was particularly helpful for me to see a Magnificent, a Berylline and a White-eared Hummingbird feeding side by side, to compare size, giz and field marks. I did see the Violet-crowned, which was more elusive, and got several good looks at the unmistakable Blue-Throated Hummingbird. I saw its underside well, as in the photograph above.